A professional massage tool you can use at home! Using the principles of acupuncture, acupressure, trigger point, zonal therapy and massage, the Massage Ball brings relief from pain caused by muscle tension and aid recovery from musculoskeletal injuries. 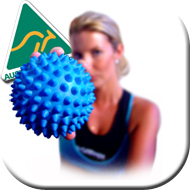 The AOK Massage Ball is particularly effective on paraspinal muscle tension and when used on trigger points. Reflexologists also report dramatic results where stimulation of zones on hands and feet may help the organism get rid of the body's waste products. By stimulating acupuncture meridian lines, it increases the body's energy flow. When using the massage Ball, you need not worry about specific locations of meridians. Just roll the massage Ball along your body applying as much gentle pressure as is comfortable. Available in retail boxes, loose or in bulk packs (30 units).